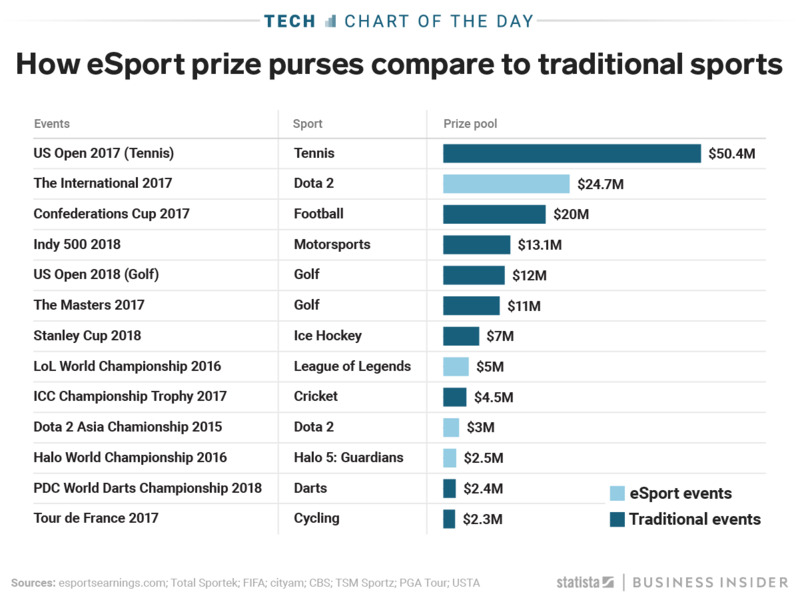 The prize pools for the biggest gaming tournaments in the world are becoming comparable to the winnings in more well-established traditional sports tournaments. After the Washington Capitals took home the Stanley Cup on Wednesday, the winning team was awarded $US4 million and the runner-up got $US3 million. That total prize pool is a third of what the first- and second-place winners of the 2017 International gaming tournament took home in 2017. While the prize money for the 2017 Tennis US Open is by far the largest of the ones listed, this chart from Statista shows that the 2017 International offered a prize pool larger than the 2017 Confederations Cup and twice the size of the 2017 Masters. And all but $US1.6 million of that $US24.7 million was crowdfunded. 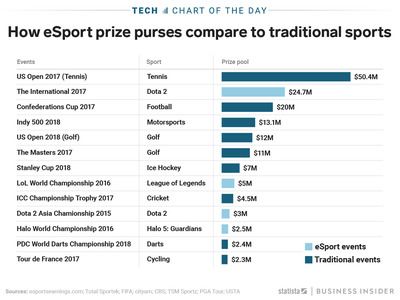 This comparison is a good representation of the increased popularity of eSports in recent years; the better the e-games and the larger the gap between skilled and amateur players, the bigger the winning money. Right now, professional gamers are winning big.